Next Papyrus, maker of the PageOne HD ereader (I posted about it a few weeks back), has been posting a bunch of videos about their new device lately (here's another). Last night I came across an impact test. They dropped golf balls on the screen and also threw the golf balls at the screen, just to see if they could kill it. If you've ever wanted to see the backside of an E-ink screen, watch this video. The middle section of the video is rather funny because whoever is throwing the ball has my athletic skills. They keep missing the device. BTW, the first section of the video shows 2 screens, and only one is the newer HD E-ink screen. The black frame is the older screen, and the reason it broke is that it has a glass backplane. The newer HD E-ink screen uses a metal foil backplane (developed by LG Display I believe). 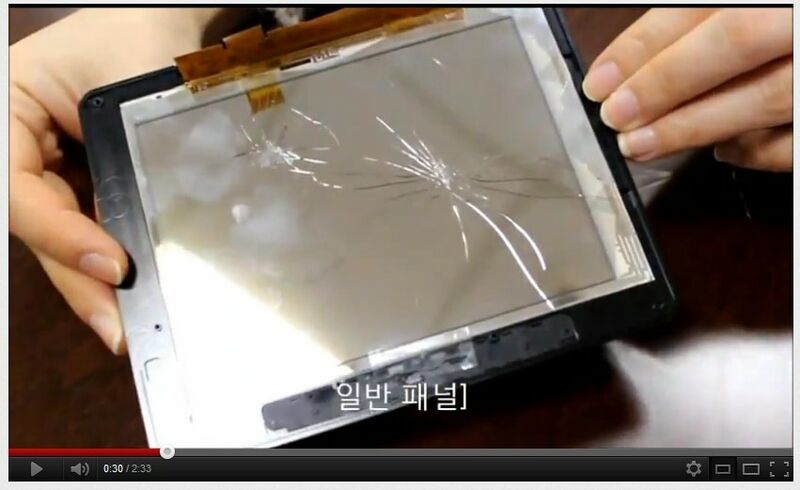 As you can see from the video, it's a lot sturdier than glass. Another good reason to pick up a $50 Story HD. Seems like it would be the go to choice for backpacking…. or golf? Do you think that Iriver HD has the same screen? That would make it much more interesting. It is the LG HD screen. Can’t say if it’s the same one shown in video. I would think that chances are it is.